The People vs the Needle – MostlyAboutBeer……..
Every year in the local authority I work for, an email circulates which leads to the same debate. As we approach winter, the front-line staff are offered the flu jab and the discussion about whether it works and whether it’s worth it is repeated. Stephen Fry (or someone who can do his voice) advises us to get the jab on a radio advert and we trust uncle Stephen when it comes to facts. We just don’t trust the local authority as much. We are a contradictory populace: Seeing an image of a UN health worker offering a kind face to a wide-eyed child in Gambia about to be vaccinated kindles a warmth inside us. Silver mucous strips below the infant’s nose denote that tears have been shed through fear but the epidemic is about to be foiled by our intervention. It stirs up notions of charity, of progress, of parental protection, of kinship across nations and of hope. Yet when vaccination reaches out to the children here in the West we suspect ulterior motives and conspiracy. Non-establishment “experts” suddenly appear. Why this change in dynamics? Vaccination: Medicine and the Masses at the London Hunterian Museum isn’t just an historic exhibition as it’s still relevant today. The friction and trust – or lack thereof is still alive and well, or as the introduction puts it: ‘the changing relationships between the medical profession, the state, individual patients and the wider public’. Vaccination followed on the heels of inoculation – a practice that goes back further than I realised. Inoculation gives you a tiny dose of the illness you want to avoid. It’s counterintuitive but was used centuries ago in the Ottoman Empire: pus from the blister of a moderate sufferer was scooped out and spread over an open cut of someone yet to contract the illness making their symptoms moderate in turn. This practice was brought to Western Europe in 1721 by Lady Mary Wortley Montagu – a skilled writer and anthropologist whose work merits its own museum. The person credited with vaccination – using a different illness to protect against a worse one – was country Doctor Edward Jenner. He noted that sufferers of the much less deleterious cowpox didn’t get afflicted by the oft deathly smallpox. The ‘vacc’ in vaccination relates to the Latin for cow – similar to Vache in French. Under glass there is part of a manuscript to Edward Jenner’s “Inquiry into the Causes and Effects of Variolae Vaccinae” (as it was then called). On display there’s a painting of Edward Jenner by William Say where the subject flicks through illustrations of smallpox lesions. During the 18th century, smallpox killed up to 60 million people. In Britain in 1840, inoculation was made illegal (plenty of parents now throw chicken pox parties which is inoculation) and vaccination was provided free of charge by the state. After 1853 it became mandatory for all children to be vaccinated against smallpox within four months of birth. Carrying out compulsory vaccinations required a vast administrative machinery which included the registration of all vaccinations – a level of bureaucracy hitherto unknown to the British public. The National Anti-Vaccination League was established in Britain in 1896 and was still publishing up until 1957. 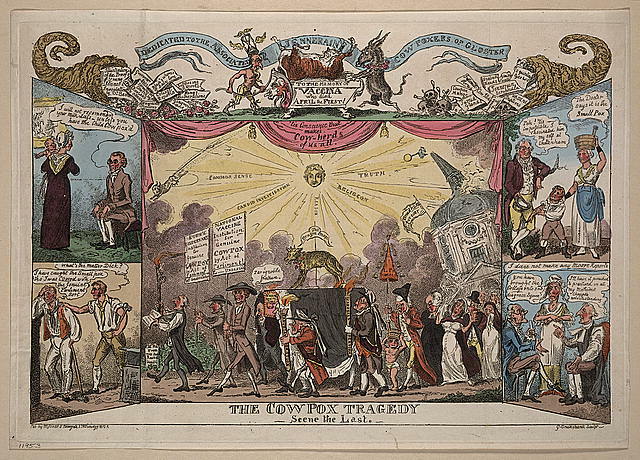 The feelings of some sectors of the public are amply demonstrated by a copy of The Cowpox Tragedy by George Cruikshank from 1812. In this undoubted work of art, the coat of arms at the top features Edward Jenner opposite a donkey decapitating a cow on an altar with a scythe. He’s also depicted as the sun shining down on a funeral procession crested by a sacred calf. In Leicester, a dummy of Edward Jenner was hanged and beheaded by a violent crowd. Despite there being no evidence for it, it was believed that vaccination could cause cancer, syphilis, meningitis and pneumonia. An image was published by James Burns (who swore by spirituality and phrenology) that represents the state as police and doctors literally “coming for the children”. 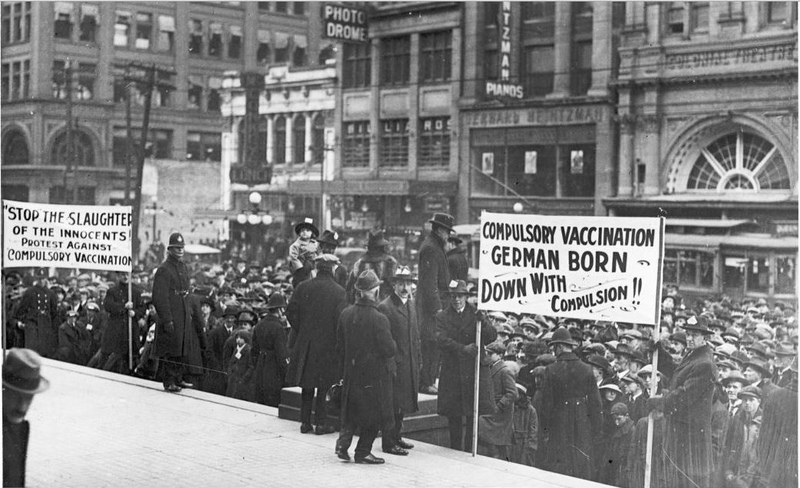 Compulsory vaccination was eventually abolished in 1907. Looking back, the evidence that the smallpox vaccination saved the lives of millions seems irrefutable: in 1977 smallpox was declared eradicated making it the first, and so far, only human disease to be completely eliminated globally. On display are some of the disturbing photos of patients with smallpox – especially the children. Suspended in preservative liquid, there is half a child’s face bearing the disease’s lesions; it’s painful to look at yet you’re drawn to it. You can see an original vaccination form from around 1853 and there’s a collection of lancets splayed out like the wing cases of exotic coleoptera from the Natural History Museum. A case from 1901 containing actual phials of tuberculosis that belonged to physician Robert Koch is mounted near the exit. You can’t help but itch in this exhibition. As a soundtrack, a government sponsored film called Surprise Attack from 1951 is broadcast on a screen in the background. It’s about an outbreak of smallpox spread by a girl who contracts the disease off a rag doll. It’s reminiscent of a black and white episode of The Twighlight Zone; eerie orchestral overtures bolster the sense of impending dread. The benefit of science is that it’s demonstrable and based on research and evidence. The problem with the masses is that they’re unlikely to follow scientific research and condensations aren’t always possible. Those that do understand the conclusion didn’t simply skip to it – they need to understand each successive step on its trajectory. For the unlearned, science appears supernatural. People that can demystify it to laypeople should be cherished. We have recently seen the possible eradication of polio stopped in its tracks after fears in Pakistan that it was an American/Zionist plot to weaken Muslims or render them sterile. Even Robert De Nero has courted controversy at his Tribeca Film Festival. He was about to screen a film by ex-British Doctor Andrew Wakefield that claims the MMR vaccine causes autism. The distrust is still very real. If I could have seen something more in this exhibition, it would’ve been to see the MPs’ input at the time. This was an age where many members of Parliament were also members of the Royal Society and much more informed scientifically than the poor of the parish they represented. Who among them tried to gain the electorate’s trust and which found it too daunting – preferring instead to echo the hue and cry against state incursion to safeguard their own seats? Maybe that’s a whole other exhibition in itself. The Hunterian Museum has many human cadavers on display. This time however, it goes deeper than the sinews and muscles splayed out in jars to our very core – it exposes the viscera of our group mentality. We are the exhibits here. It’s restricted to one small packed room – the Qvist gallery with its red and white motif – the surgeon’s colours. Despite its dwarfism, you can easily lose yourself in it as I did.